The high ground known today as Flodden Hill forms the eastern end of a ridge sometimes also known as Flodden Edge. The ridge extends westward from Flodden Hill itself, taking in King’s Chair Hill, and East and West Flodden Hills. This area of high ground and the slopes to the north and south are dotted with archaeological sites – some still visible as earthworks on the ground, others now identifiable only as crop-marks in aerial photographs or known because they were recorded by antiquarians. Three sites were investigated between Flodden Hill itself and King’s Chair (fig. 1). A prominent rectilinear earthwork on the hill-top (Site 1), and a bank running off to the west towards another rectilinear site now ploughed out (Site 2), have, since at least the 19th century, been associated with the Scottish army’s camp before the battle of Flodden. Site 1 is specifically identified in the Northumberland Historic Environment Record (HER) as a sixteenth-century gun emplacement. This interpretation is problematic. No sixteenth-century accounts actually refer to the construction of defences. The Trewe Encountre (Anon. c.1513) says the Scots army ‘was enclosed in three parties, with thre great mountaynes soe that there was noe passage nor entre unto hym but oon way wher was laied marvelous and great ordnance of gonnes’. The Howard Memorial (c.1524) describes the Scots position as being on ‘Flodden-hills, a ground impregnable’ where James IV lay ‘like one minded to keep it like a fortress’ (Weever 1631, 838). Hall (1548) refers to it as ‘the syde of a hyghe mountayne, called Floddon’ and states that ‘at the foot of the hyll lay all hys ordinance’. The inference clearly is that the high ground was itself regarded as being like a fortress, and the train of artillery was sited in one position at the foot of the hill. However Goodwin (2013) says of the Scots’ position, ‘to the naturally strong defensive mound of Flodden Hill had been added field fortifications’, and that the guns were ‘based on Flodden Hill’ and ‘on the side of Flodden Edge’ – these statements are unreferenced. Therefore, the aim of the excavation was to seek archaeological evidence for the extent of the Scottish army’s occupation on the hill. There is no known record of the placename ‘Flodden’ before 1513. It may derive from the Old English elements dun ‘hill’, and either flode ‘channel, stream’ or floh ‘fragment, bit of stone’. Contemporary accounts of the battle such as the Trewe Encountre refer vaguely to ‘a high hill’ and ‘a grounde bye, callid Floddon’. Only in later chronicles does the ‘high hill’ become ‘the hyll, called Floddon hyll’ (Hall 1548) or ‘a great Mountaine, calld flodon’ (Stow 1580). The Armstrongs’ representations of (above) Flodden Hill and (right) Housesteads (courtesy of Newcastle City Library)The earliest map of Northumberland to name Floddon Hill is Saxton’s in 1579, which also marks the village of ‘Brankeston’. Flodden Hill appears on John Speed’s 1610 map with, to the north, a tent surmounted with a pennon; a symbol Speed seems to have used to indicate the site of a battle. Before the 18th century, maps show little other detail, then in 1716 John Warburton’s map marks for the first time the ‘King’s Chair’ with what appears to be a rectangular enclosure (unlabelled) on the hill to the east. More detail appears on Lieut. Andrew Armstrong and Son’s A Map of the County of Northumberland, published in 1769. This shows ‘King’s Chair’ and a larger hill to the east, captioned ‘Floddon’ (below). The latter is crowned by a rectangular feature with ‘entrances’ on all sides and short spurs projecting from each corner. This is the Armstrongs’ conventional symbol for Roman – or what they considered to be Roman – forts and camps, and is used all along the Hadrian’s Wall section of their map (below). It has however been mistaken as representing an artillery fortification with pointed corner bastions. Intriguingly though, a manuscript plan by Richard Richardson drawn a few years later in 1780 for the enclosure of Branxton common, shows the western part of a very large enclosure with semicircular projections at the north-west and south-west corners, connected by ditched and embanked ‘Intrenchments’. The enclosure is captioned ‘Camp where the Scots laid before the Battle of Flodden field’ (fig. 2). Unfortunately, the eastern part of the ‘Camp’ lay outside Richardson’s survey area, and was not recorded. Most of Richardson’s plan can be overlain on a modern basemap with remarkable accuracy, but there may be some error where his survey was taken onto the high ground. Smith’s survey was used by Henry MacLauchlan in the 1850s, by which time agriculture was fast eroding the earthworks of Site 2, leaving only ‘Faint traces of a Redoubt’. MacLauchlan also noted the eastern ‘redoubt’ with its surrounding earthworks (Site 1), but not the large enclosures between the two, and captions Smith’s linear earthwork as a ‘Line of Intrenchment occupied by James A.D. 1513’. Fig. 5 Lidar image of Flodden HillShortly afterwards (1860) when the Ordnance Survey first mapped the hill, Site 2 had been ploughed out. They recorded Site 1 as a multivallate feature simply labelled ‘Camp (Remains of )’ and showed the linear bank, but in place of Smith’s rectangular enclosures depicted an ovoid enclosure, angled to the south-west. The linear earthwork is also shown continuing across Site 1, and crossed by a north-south bank to the west. These features are visible on lidar imagery (fig. 5). In 2000 a rectilinear enclosure on the lower eastern slope of the hill was excavated and found to be late Iron Age/Romano-British (Passmore and Waddington 2009). The following year the BBC television series ‘Two Men in a Trench’ excavated two sites, one on the north-east slope of the hill, and the other on the ridge just west of Flodden Hill plantation (Pollard and Oliver 2002). The site on the north-east slope was interpreted as a gun emplacement, though lidar and Ordnance Survey mapping show it to be a quarry, one of several on the hillside, dating from the late 19th, early 20th century (see fig. 6). This misinterpretation, and the identification of a boundary dyke nearby as a defence from 1513, seems to have encouraged the concept of a heavily defended ‘fortress Flodden’. In Trench 2 and 16 the rampart had a clay core forming a bank, revetted externally with large boulders and an inner face of smaller stones (central revetment), all together c.2.5m-3m wide (Fig. 7). Fig. 7 Trench 2: the southern rampart (2009) looking east, showing outer and central revetments and possible post- holes © Gordon MoirRubble on top of the bank and spilling down both sides suggests the revetments were once higher with a core of stones above the clay which had collapsed when the revetments were later robbed. Two possible post-holes were found cutting the top of the clay bank (Fig. 7). Inside the rampart was a ledge 1.5m wide, apparently an artificial ‘step’ cut into the bedrock, with a line of mediumlarge boulders along its inner (northern) edge. This may have been the true inner face of the rampart or just a low kerb forming part of a stepped inner face. This, and the ledge were covered by dark silty soil and rubble containing fragments of Iron Age pottery which also butted the ‘central’ revetment. Similar dark soil and rubble in Trench 16 contained two early 20th century glass bottles and a utilised stone. Fig. 8 Trenches 3, 11, 12, 14 and 15 showing principal features and alignments. Letters a – e are referred to in the text. Approximately in the centre of the east rampart, Trench 3 revealed an entranceway approached from the east by a ‘hollow-way’. This was partly flanked by dry stone revetments or kerbs, which may have been the remains of defensive features known as horn-works (Fig. 8, features a and b). A line of smaller stones (feature c) behind the southern ‘kerb’ may be part of its construction, or an earlier edging. The presence of a few postholes may mean the revetments incorporated upright timbers. Fig. 9 Trench 17: Inner (west) face of rampart At some later date the width of the entranceway was narrowed by a stone blocking on its north side (feature d). Subsequently it was completely choked with rubble – either a deliberate act ‘slighting’ the Enclosure, or a result of the stone core of the rampart terminals on either side collapsing. Running through the blocked entrance and visible in Trench 11 within the release pen, was a line of stones following the course of Smith and MacLauchlan’s linear earthwork. North of the entranceway (Trench 17) a line of stones visible on the ground surface on the west (inner) side of the rampart were again found to be part of a rubble core-work. These had been retained by an inner revetment of larger stones which survived only one or two courses high (fig. 9). Rubble overlying the remains of the revetment were probably also core-work which had collapsed after the upper courses of the revetment had been robbed. A small patch of burned soil underlying the revetment yielded a C14 (Carbon 14) date of 7-131AD, in the late Iron Age/Romano-British period. On the outer (east) slope of the rampart was a deep layer of brown soil and tumbled boulders, heavily disturbed by animal burrows and full of voids, which contained the end-cap of a 12-bore shotgun cartridge. The boulders may represent the collapse or robbing of the external revetment. Below were more loose, tumbled, boulders and gravel, overlying a compact clayey soil surface. This rose gently to the east, becoming part of a gravelly bank interpreted as the inner of the two earlier bivallate ‘hillfort’ ramparts. At the lowest point of the trench, between the Inner Enclosure and the earlier rampart, was a patch of silty material heavily flecked with charcoal which produced a date of 175-1 BC, in the pre-Roman Iron Age. This was possibly the base of a shallow ditch. In 2009 a feature running north-west/south-east was recorded on the eastern side of the rampart (feature A). This was initially interpreted as the base of one side of a ‘corner bastion’ – mistakenly thought to be shown on Armstrong’s map. The area had been very disturbed by tree-roots, and this identification was disproved when the trench was re-opened and extended in 2012. Instead, running roughly north/south across the trench and across the east end of feature A was a stone revetment up to three courses high. Behind this was a bank of stoney clay which dipped down to the west into a possible ditch, the line of which was marked by a deposit of dark silty soil with stones. The revetment and bank appeared to represent the inner of the bivallate ‘hillfort’ ramparts. The original form of the Inner Enclosure rampart was difficult to determine, having been greatly disturbed by later features described below. A rough revetment of boulders two or three courses high with rubble and earth behind, was found in 2014 which may be the remains of the original outer face to the rampart. If so it had been cut through when one of the later features (B) was constructed. Further north no formal rampart structure was found, but an area of apparently random tumbled and fairly large stones could be the disturbed remains of the continuation of the outer face. The inner revetment of the rampart also appeared to have been cut by feature B. On the crest of the rampart was a stone-packed posthole, the fill of which produced a date of 358-280 BC, in the Iron Age. A well-sealed deposit below the inner revetment of the rampart gave a date of 61-218 AD, comparable with the Romano-British date yielded by a similar deposit in Trench 17. Another trench (10) adjoined Trench 5 at the north-east corner of the Inner Enclosure rampart. The crest and inner (south) face was covered with rubble, again probably collapsed upper core-work. The rubble covered a single course of medium-large boulders, presumably the remains of the inner revetment. On the rampart crest, as in Trench 5, was another possible post-hole. The outer (north) face of the rampart seemed to have been significantly disturbed, perhaps when the track over the hill was made in the second half of the 19th century. On the north-facing slope there was no comparable scree of rubble. Below topsoil was a mixed deposit of stones and lumps of clayey silt, overlying loose silty soil and stones which included a large sherd of Iron Age pottery and a flint flake. This mixed deposit persisted down to the lowest point reached by the excavation, at 1.28m below the surviving crest of the rampart. As in Trench 5, there appeared to have been significant disturbance to the outer face of the rampart, possibly associated with building the track over the hill in the second half of the 19th century. On the rampart crest was a possible post-hole, similar to that in Trench 5. The enclosure ditch was investigated in Trenches 4, 7 and 9. There was some evidence in Trench 9 that the northern ditch had been partly recut, but this is undated. Part of the south ditch was exposed in Trench 4, which also sampled two geophysical features interpreted as platforms. Here, stones forming a wall appeared to overlie a cobbled area which extended into Trench 5. Here they again appeared to underlie a north-south revetment wall, which perhaps defined the east side of one of the platforms. Part of a curved stone feature was revealed in Trench 8. This overlay a drain or flue following the same arc, with a stone base and cap-stones and associated with large fragments of Iron Age pottery. A C14 sample from the fill of the drain/flue was dated 154-140 BC, also placing it in the Iron Age. Without full excavation the function of this feature remains uncertain. It may have been a corndrying kiln, or even a round-house. Aerial photographs and geophysical survey also show a substantial ditch-like feature running west from the enclosure, and a narrower one cutting across its northern half. The south edge of a linear cut - possibly this feature - were found in Trench 9. Near the south-east corner of the enclosure two more linears, one narrower than the other, cut across the corner of the field. Both make sharp changes in alignment at this point, suggesting some relationship between them and the enclosure. These were investigated in Trenches 1 and 11. One was a ditch some 3m wide which had been re-cut, with the remains of a possible upcast bank to the south. To the north was an alignment of large pits linked by a shallow gulley. In Trench 1 the pits had traces of burning suggesting they might be hearths. A single C14 sample dates the burning to the early Iron Age (515-380BC). Sherds of Iron Age pottery came from two of the Trench 11 pits. Stones found in the bases of all the pits may represent the remains of packing for posts, and the ‘gulley’ is perhaps vestigial evidence for a fence or barrier running between them. The rectilinear outline of Site 2, its dimensions (c.80m east-west by c.60m north-south), and possible eastern entrance, all suggest it was an Iron Age/Romano-British farmstead or settlement. This appears to be confirmed by pottery and the two C14 samples which returned dates in the second half of the 1st millenium BC. There were indications of possible re-use in the medieval period, but no evidence was found to support MacLauchlan’s view that this site was an early 16th century ‘redoubt’, constructed by the Scots prior to the battle. East of Site 2, the course of MacLauchlan’s ‘line of Intrenchment’ was investigated in two places in 2014. This feature survived within Floddenhill plantation as a low bank running eastwards up to Site 1. Projecting its course westward towards Site 2 it crossed the south end of Field 28 where any surface traces of the linear earthwork have been ploughed out. In 2001 ‘Two Men in a Trench’ excavated in this area, finding concentrations of stones, patches of darker soil, and an arc of small stones. Geophysics revealed some anomalies here and a small test-pit was opened in 2014 revealing a band of dark stoney material, possibly ditch fill, approx. 0.5m wide. This appeared to end in a rounded terminal in the centre of the test-pit though it may have continued south-west beyond the trench edge. This area needs further archaeological investigation. Site 1 where it joins other boundary banks, suggesting it was a land boundary rather than a line of defence. It presumably pre-dates the plantation, which seems to have existed by the 1770s. Fig. 15 Site 3: trenches, crop mark and main geophysical survey resultsThis site also appeared as a crop-mark, on an RAF aerial photograph of 1945, which shows part of an apparently doubleditched rectilinear enclosure emerging from the ‘Nursery Plantation’. It was not mentioned by Maclauchlan, which suggests it had already been ploughed-out, though he did record the faint traces of a circular ‘camp’ a little to the east, in what is now a plantation. (see fig. 4). The crop-mark was similar in size and form to Site 2, but was investigated because there was a possibility that it represented the south-west ‘bastion’ shown on the 1780 enclosure plan. Geophysical survey of several areas within the field, including the crop-mark site, identified a number of ‘anomalies’ which were suitable for investigation (fig. 15) (Guard 2014, AS&C 2014). Two trenches were excavated in 2014. One (Trench 3) was sited to investigate a substantial geophysical feature which appeared to be the inner ditch of the enclosure showing on the 1945 aerial photograph. Below ploughsoil were charcoal-flecked deposits and iron pan, containing a sherd of Iron Age pottery. At this level the inner edge of the ditch emerged, turning an angle towards the south. The soft silty fill contained a sherd of Iron Age pottery and a possible cup-marked stone. The upper fill was sampled and returned a date of 47BC – AD70. Lower fills contained a flint flake, two egg-shaped pebbles – possibly sling stones - and small pieces of burned clay or pottery. A carbon sample returned a date of 360-271BC. The fills continued below, but after a day of torrential rain this end of the trench became so badly waterlogged that no further excavation was possible. Trench 2 was laid out across two east-west linear geophysical anomalies which might have been ditches, but only half the intended length was excavated. Two narrow cuts running east-west were found, but both were field drains. One was a stone-filled ‘rumbler’ drain roughly corresponding to one of the anomalies. The other, not clearly identifiable in the geophysics, contained a ceramic drainpipe probably of ‘horse-shoe’ section. Other apparent alignments of small stones were ephemeral, and probably plough-grooves. The pre-agricultural ground surface was sampled and returned a C14 date of 358-280BC. At the northern end of the trench an area of disturbance was sampled and produced a date of 164-128BC, again reflecting activity in the pre-Roman Iron Age. The datable finds from the Flodden Hill investigations are either prehistoric (principally Iron Age) or, apart from a few sherds of 13th/14th century pottery at Site 2, belong to the 18th century onwards. All the C14 samples have returned dates no later than the pre-Roman Iron Age - early Romano-British period. This is unsurprising as rectilinear sites of comparable dimensions to Sites 1 – 3, many with eastern entrances, occur elsewhere in the Milfield area and are known, or suggested to be of this period (Passmore and Waddington). No structures indicative of artillery positions were found at Site 1. The symbol on the Armstrongs’ map is demonstrably a convention they used for Roman camps. What then can we make of the substantial ‘Camp’ indicated on Richardson’s 1780 Enclosure plan? Was this what the Armstrongs were representing - though they considered it to be Roman? Richardson was also employed by the Dean and Chapter of Durham to survey their estates. He was thus an experienced surveyor and would have been working to a high level of accuracy. His survey was done just before agricultural improvements encroached onto Flodden Hill, so the obvious conclusion is that he planned just what he saw, and that all surface traces have subsequently been erased. Against this there are no crop-marks or geophysical survey anomalies that show such a feature, though conceivably the ‘intrenchments’ may have been ephemeral low turf-built features which have left no subsoil traces. Another possibility is that Richardson saw upstanding Iron Age earthworks and mistook them to be - or was told they were - parts of the Scottish camp. If so Sites 2 and 3 could have been Richardson’s north-west and south-west ‘bastions’, but they are not as squarely aligned as his plan shows. The connecting lines of ‘Intrenchment’ might have been extrapolated to present a militarylooking enclosure, or were actually agricultural boundary banks, pre- or post-dating 1513. It is perfectly possible that the Scottish army in September 1513 occupied these upstanding earthworks, whose banks offered some shelter from the elements and provided ready-made enclosures that could serve as leaguers. Parts of these may have been modified to suit circumstances, and banks may have been constructed to link them but the archaeological evidence is, at present, lacking. If such a camp had existed, with Sites 1, 2, and 3 forming three of its corners with ‘bastions’ there are no crop-marks or antiquarian reports of a similar site which could be the south-east corner – assuming of course that it was rectangular in form. The absence of sixteenth-century finds is also open to a number of interpretations, the most obvious being that there was no occupation on what is now Flodden Hill, and perhaps the army lay further west along the Flodden ridge. It seems inconceivable though that this part of the ridge, looking out to the river crossing at Ford, would not have been used. However the artefactual ‘footprint’ that a medieval or early modern army might leave need not have survived – much of an individual soldier’s equipment would have been organic: wooden bowls, horn spoons, leather water/ wine bottles. Such things if abandoned would have disappeared either in the firing of the camp’s litter, or through subsequent decay. Substantial quantities of pottery are unlikely to have been carried because of the weight, and there were no clay tobacco pipes in 1513! Metalwork, be it brass cooking pots, knives, armour or weapons, would either have left the hill with the army, or been scavenged afterwards by the local population. In conclusion it must be said that there is at present no archaeological evidence for a Scottish presence on the hill in 1513. Anon. c.1513 Trewe Encountre reprinted in Proceedings of the Society of Antiquaries of Scotland Vol.17 1867. 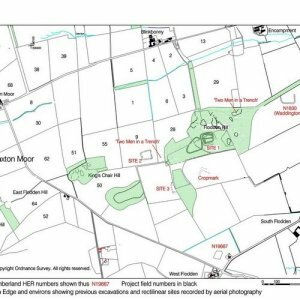 Archaeological Survey and Consulting (AS&C), 2014 Geophysical (Total Field Magnetometry) Survey Report, Flodden 3, Flodden, Northumberland, (FLO14c) Manchester. BRO Berwick Record Office, NR0 1216/B2/4/5 Ford Estate accounts. Burgess, C.B. 2013 Excavations at Flodden Field Site 2, Project Design and Method Statement, August 31st 2013. V1.0, 2. Society of Antiquaries (of Newcastle upon Tyne) report, 1859 Archaeologia Aeliana, New Series, Vol. 3. The Antiquary, 1912 ‘Notes of the Month’, Vol.48, 206. Guard Archaeology 2014 Flodden 500 Project, Flodden Hill: Geophysical Survey, Project 3669, Glasgow. Goodwin, G. 2013 Fatal Rivalry, Flodden 1513: Henry VIII, James IV and the battle for Renaisssance Britain, London: Weidenfeld & Nicolson. Hall, E. 1548 The Union of the Two Noble and Illustre Families of Lancastre and Yorke. Hodgson, J. 1813 ‘Northumberland’ in Brayley and Britton The Beauties of England and Wales, or Original Delineations, Topographical, Historical, and Descriptive of Each County, Vol.12, Part 1, London. Weever, J. 1631 Thomas Howard’s Memorial, Thetford Priory, in Ancient Funerall Monuments within the United Monarchie of Great Britain, Diocese of Norwich, pp. 834-840. Passmore, D.G. 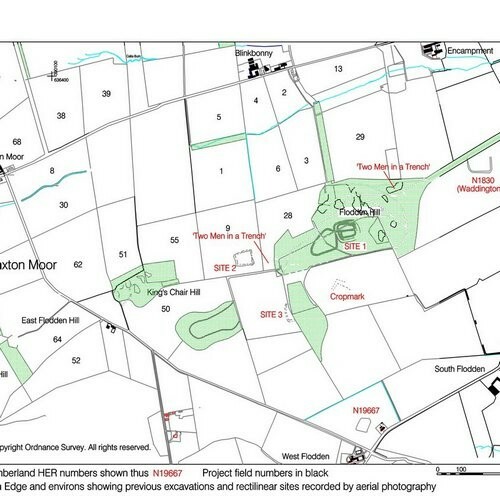 and Waddington, C. 2009 Managing Archaeological Landscapes in Northumberland. TillTweed Studies, Volume 1, Oxford: Oxbow, pp. 223-43. Pollard, T. and Oliver, N. 2002 ‘Flodden 1513’ in Two Men in a Trench, Battlefield Archaeology, the key to unlocking the past, 118-183. Richardson, M.A. 1846 The Borderer’s Table Book or Gatherings of the Local History and Romance of the English and Scottish Border, Vol. III Historical Division, 99-100, Newcastle upon Tyne. Smith, D. Alnwick Castle DNP: MS 187A/8. Manuscript volume entitled Northumberland Collection, Camps and Castles, Volume 2, D-K’ [Notes and plan]. Stow, J. 1580 Annales or a Generale Chronicle of England from Brute Until the present yeare of Christ 1580. Armstrong, A. and Son, 1769 A Map of the County of Northumberland with that part of the County of Durham that is North of the River Tyne, engraved by Thomas Kitchin. Estate plan 1823 Plan of Branxton Hill Estate in the County of Northumberland belonging to Henry Collingwood Esq. Thomas Bell Surveyor December 1823. ZHE 31/1 [Northumberland Archives]. Estate plan 1848, Plan of Branxton Buildings Estate in the Parish of Branxton in the County of Northumberland, ZHE 31/2 [Northumberland Archives]. Richardson, R. 1780 A Plan of Branxton Common in the County of Northumberland as allotted and awarded in 1780, 2DE 17/1 [Northumberland Archives]. Saxton, C. 1579 ‘Northumbriae Comitatus’ in Atlas of the Counties of England and Wales. Speed, J. 1610 ‘Northumberland’ in Theatre of the Empire of Great Britain, 1612. Warburton, J. 1716 A New Map of the County of Northumberland.